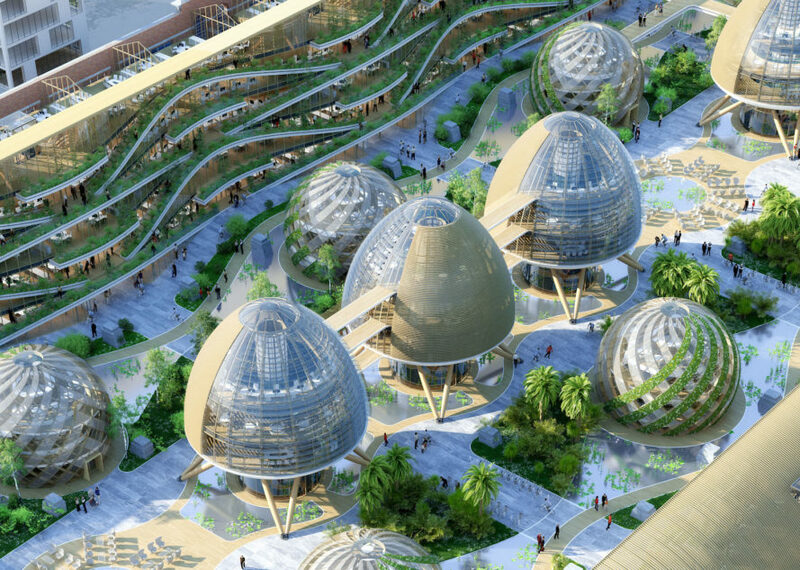 Designer Vincent Callebaut presents an amazing green facelift to the century-old warehouses at Belgium’s former industrial site Tour & Taxis in his latest designs for a mixed-use eco-neighborhood. His masterplan transforms the 40-hectare post-industrial site into a sustainable community draped in greenery that generates more energy than its residents need. His futuristic design is part of a greater vision to help European cities transition their built environments towards a post-carbon future. Built at the turn of the 20th century to serve as a major freight and customs clearance center, Tour & Taxis was once the shining jewel of industrialization’s golden age with its majestic engineering, ironwork, and stonework. The 40-hectare industrial site was built atop former wetlands located on the Brussels canal close to the heart of the city. Today, the area is undergoing major renewal and many of the impressive warehouses have been converted into offices, shops, restaurants, and exhibition spaces. Callebaut’s masterplan supports the adaptive reuse trend and expands on it with the design of a mixed-use eco-neighborhood to provide residences, as well as additional retail and office space. The redevelopment would be organized along the Brussels canal and is centered on the transformation of the Marine Terminal into the BIOCAMPUS, a 50,000-square-meter mixed-use space constructed with cross-laminated timber and inspired by biomimetic design. Three heavily landscaped residential buildings—called “vertical forests”—would sit across the repurposed Marine Terminal, totaling 85,000 square meters of new residential space. The energy-efficient architecture is designed to produce more energy than its users need thanks to passive design, renewable energy production through wind and solar, earth-air heat exchangers for natural ventilation, evapotranspiration gardens, geothermal stations, and more. Construction would use biosourced materials that contained recycled content or can be recycled according to cradle-to-cradle standards. Non-motorized transport would be prioritized in the neighborhood. Built at the turn of the 20th century to serve as a major freight and customs clearance center, Tour & Taxis was once the shining jewel of industrialization’s golden age with its majestic engineering, ironwork, and stonework. The 40-hectare industrial site was built atop former wetlands located on the Brussels canal close to the heart of the city. Callebaut’s masterplan supports the adaptive reuse trend and expands on it with the design of a mixed-use eco-neighborhood to provide residences, as well as additional retail and office space. 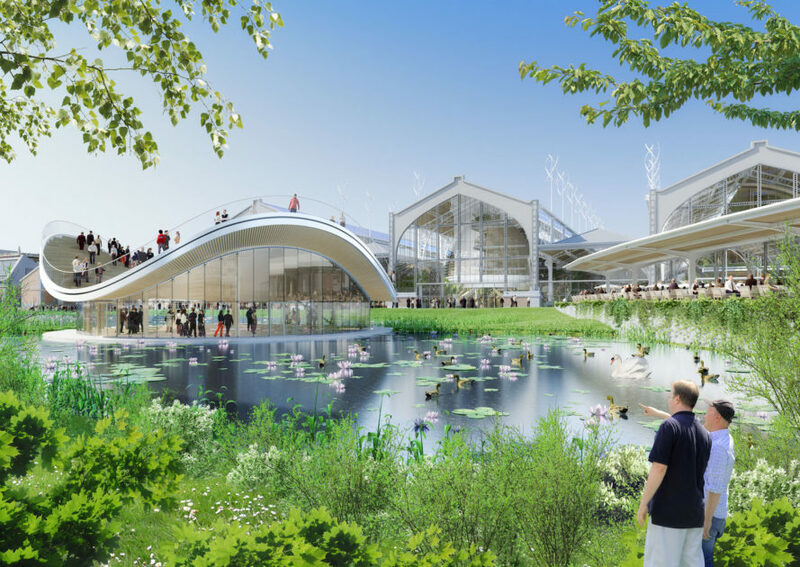 The redevelopment would be organized along the Brussels canal and is centered on the transformation of the Marine Terminal into the BIOCAMPUS, a 50,000-square-meter mixed-use space constructed with cross-laminated timber and inspired by biomimetic design. 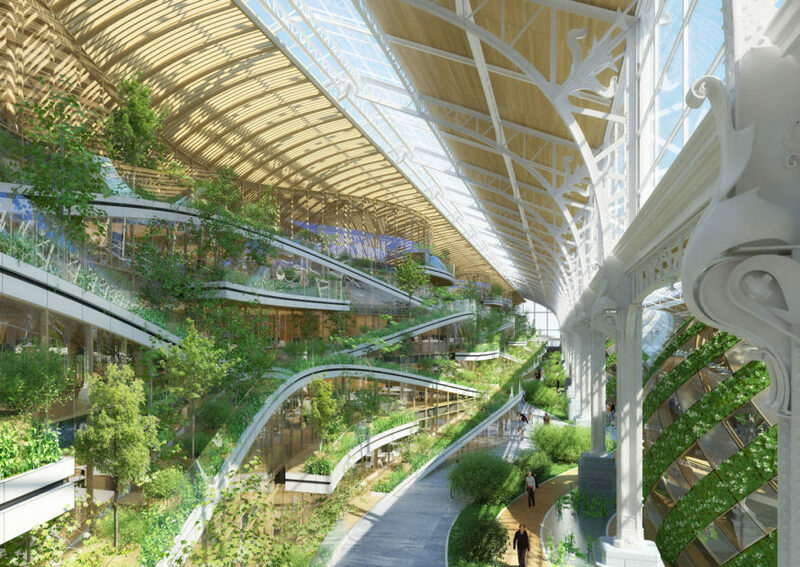 Three heavily landscaped residential buildings—called “vertical forests”—would sit across the repurposed Marine Terminal, totaling 85,000 square meters of new residential space. The energy-efficient architecture is designed to produce more energy than its on-site needs thanks to passive design, renewable energy production through wind and solar, earth-air heat exchangers for natural ventilation, evapotranspiration gardens, geothermal stations, and more. Construction would use biosourced materials that contained recycled content or can be recycled according to cradle-to-cradle standards.